Akseli Gallen-Kallela (1865–1931), Lemminkäinen's Mother (1897), tempera on canvas, 85 x 118 cm, Ateneum, Helsinki. Wikimedia Commons. My previous article looked at several of the early responses in paintings to the publication of the Finnish national epic, the Kalevala. 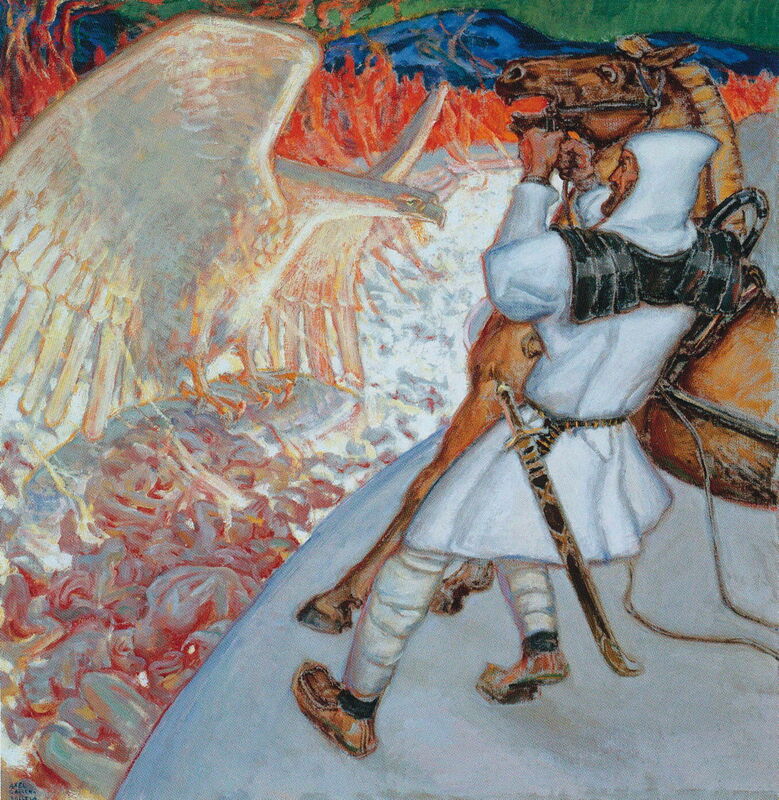 This concentrates on the single most prolific painter of the Kalevala, Akseli Gallen-Kallela (1865–1931). I have already covered his career in more general terms in an earlier article. He was born Axél Waldemar Gallén, and from the 1880s was actively researching the Kalevala. He Finnicised his name in 1907. The grandest mobile painting of his career, Gallen-Kallela’s Aino Myth (1891) is a triptych set in a gilt frame with quoted text from the Kalevala inset, showing scenes from Songs 4-5. The left panel shows the first meeting between Väinämöinen, the central figure and hero of the epic, and the young Aino, Joukahainen’s sister, in the forest. The perpetually ancient Väinämöinen there asks Aino to be his wife, to her shock and anger. The girl runs back to her mother in tears, and tells her. Her mother offers no sympathy, but tells her to stop crying, and to rejoice at the offer. Aino remains distressed at the prospect of marrying such an old man, so wonders off, and becomes lost in the forest. She comes across the shore of a strange lake, where she sees the maids of Vellamo playing in the water, as shown in the right panel. She enters the water to wash, and drowns. In Song 5, Väinämöinen goes to fish for Aino in the lake, and catches a salmon, which he tries unsuccessfully to cut up, so the fish slips back into the water. It then changes into Aino, who mocks Väinämöinen that he may have held her in his hands, but he cannot keep her, shown in the centre panel. She then disappears. Väinämöinen then travels to Pohjola to court the Maiden there. A copy of the triptych is also in the Musée d’Orsay in Paris. Akseli Gallen-Kallela (1865–1931), Joukahainen’s Revenge (1897), tempera on canvas, 130 × 125 cm, Turun taidemuseo, Turku, Finland. Wikimedia Commons. 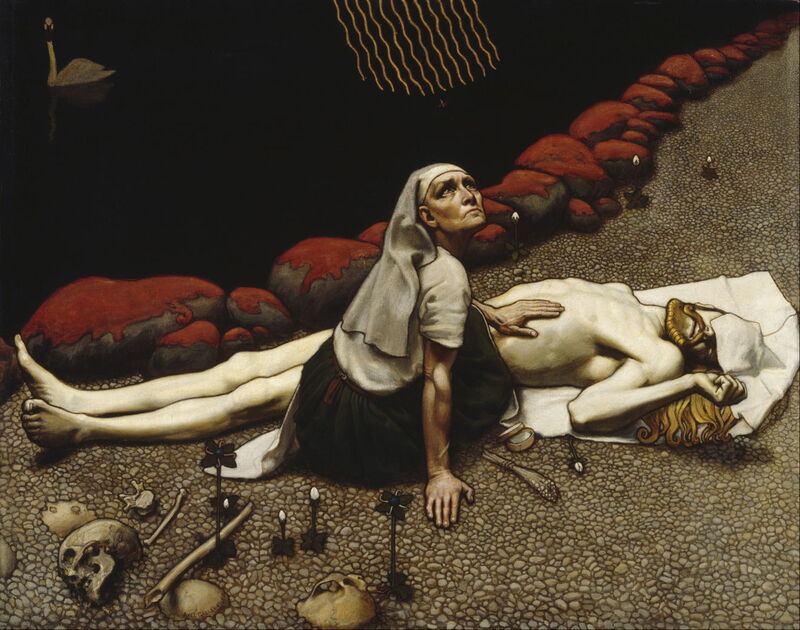 Joukahainen’s Revenge (1897) shows the consequences of the death of Aino, from Song 6. Aino’s brother, Joukahainen, understandably bears a grudge against Väinämöinen, and waits for him to make the return journey from Pohjola. Joukahainen eventually catches sight of his quarry riding across a frozen lake, as shown here, and shoots at him with his crossbow, but strikes the horse. Väinämöinen falls into the water, where the wind catches him and carries him out to sea. Joukahainen rejoices, as he thinks that he has seen the last of his enemy, but Väinämöinen is rescued by an eagle which takes him back to Pohjola. 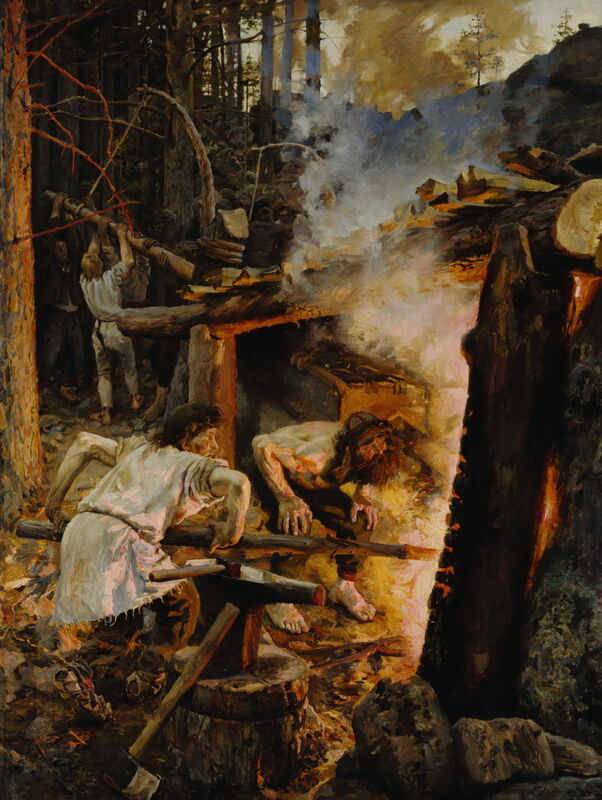 Akseli Gallen-Kallela (1865–1931), Forging of the Sampo (1893), oil on canvas, 200 × 151 cm, Ateneum, Helsinki. Wikimedia Commons. Forging of the Sampo (1893) is Gallen-Kallela’s first depiction of this central event in the Kalevala, described in Song 10. Väinämöinen returns home, and urges Ilmarinen to go to court the Maiden of Pohjola, who can be won by forging a Sampo – a mysterious talisman whose nature remains undefined. When Ilmarinen refuses, Väinämöinen uses magic to transport him to Pohjola in a whirlwind. Once there, Ilmarinen forges the Sampo, but the Maiden of Pohjola declines his offer of marriage, leaving him to return home disconsolate. The next three paintings appear to be concerned with the death and recovery of Lemminkäinen in the River of Tuonela, described in Songs 14-15. Akseli Gallen-Kallela (1865–1931), By the River of Tuonela (study for the Jusélius Mausoleum frescoes) (1903), tempera on canvas, 145.5 × 77 cm, Ateneum, Helsinki. Wikimedia Commons. By the River of Tuonela (1903) was a study completed in preparation for Gallen-Kallela’s frescoes in the Jusélius Mausoleum in Pori, a lavish memorial to the daughter of an affluent businessman, the girl having died at the age of eleven; in 1895, Gallen-Kallela’s own daughter Marjetta had died when even younger. It is the only such mausoleum in Finland. In Song 13, Lemminkäinen is assigned three tasks in order to win the hand of the Maiden of Pohjola in marriage. He completes the first two, hunting down the Hiisi elk on ski, and bridling the fiery-mouthed Hiisi gelding in Song 14. The third and final task is to shoot a swan on the River of Tuonela, in the underworld. This study appears to show Lemminkäinen boarding a canoe to attempt that task (as far as I can discover). Sadly the frescoes themselves underwent rapid deterioration, and were finally destroyed in a fire in 1931, but were repainted by Gallen-Kallela’s son, Jorma. Akseli Gallen-Kallela (1865–1931), Lemminkäinen Came to the River (1920), media and dimensions not known, Private collection. Wikimedia Commons. Lemminkäinen Came to the River (1920) takes the story one step further, with Lemminkäinen on the bank of the River of Tuonela, in the underworld, confronted by a fearsome white eagle which guards the bodies of the dead below. He is then killed by a malicious cowherd, who had taken offence at Lemminkäinen earlier. His body is cast into the River of Tuonela, where is it dismembered when in the rapids. Akseli Gallen-Kallela (1865–1931), Lemminkäinen’s Mother (1897), tempera on canvas, 85 x 118 cm, Ateneum, Helsinki. Wikimedia Commons. 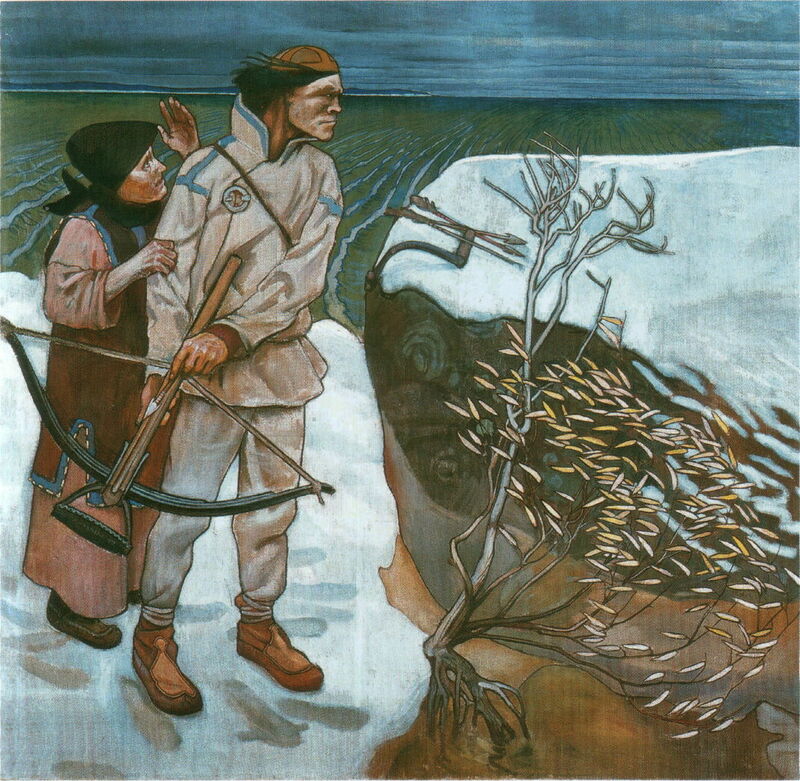 Lemminkäinen’s Mother (1897) sees portents of her son’s death, obtains information about it, and takes a rake to the rapids. There she recovers her son’s body parts, joins them back together, and uses charms and ointments to resuscitate him (shown here). In the background is the swan which her son was trying to kill, and she is surrounded by the charms and devices which she has been using to bring him back to life. She succeeds. 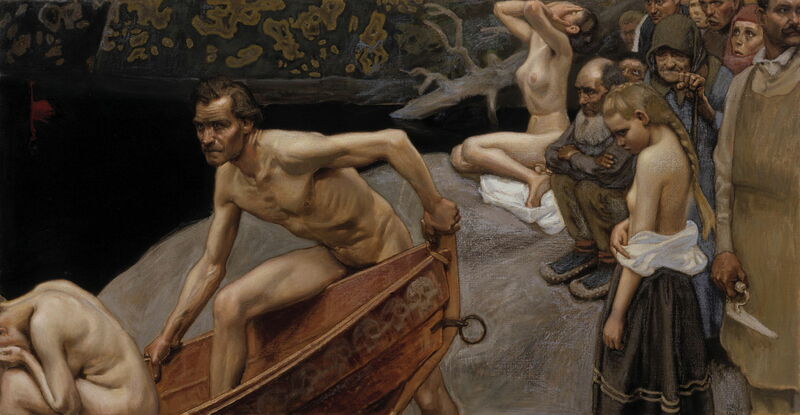 Akseli Gallen-Kallela (1865–1931), Kullervo Cursing (1899), oil on canvas, 184 x 102.5 cm, Ateneum, Helsinki. Wikimedia Commons. In Songs 31-36, Untamo lays waste the territory of his brother Kalervo, leaving just one surviving woman, who is pregnant. She gives birth to a son, Kullervo, who – while still in his cradle – vows vengeance on Untamo. Kullervo is abused as a child, and brought up as a slave. As he grows up, he spoils everything that he touches. He is sold as a slave to Ilmarinen, who sets him to work herding cattle. Ilmarinen bakes a stone into the bread for his lunch, and when Kullervo tries to cut the bread, he ruins his knife, the only memento of his family. 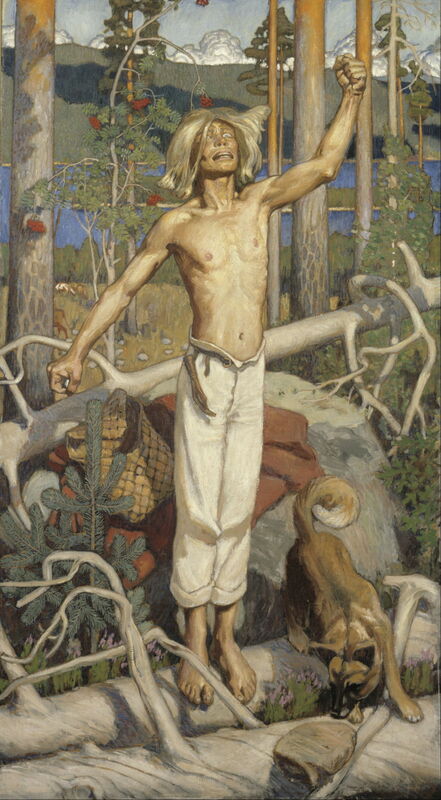 He stands cursing in anger, shown in Kullervo Cursing (1899). The next two paintings, and the last of Gallen-Kallela’s movable works which I show here, concern the later history of the Sampo, the talisman which was forged by Ilmarinen before, and kept in Pohjola. In Song 39, Väinämöinen and Ilmarinen set off on an expedition to recover the Sampo, arriving at Pohjola in Song 42. Akseli Gallen-Kallela (1865–1931), The Abduction of Sampo (1905), oil on canvas, 103 × 65 cm, Malmö Konstmuseum, Malmö, Sweden. Wikimedia Commons. Väinämöinen plays his kantele (Finnish harp) and lulls the forces of Pohjola to sleep. In The Abduction of Sampo (1905) they are shown removing the Sampo from the stone mountain, to take it down to their boat. Akseli Gallen-Kallela (1865–1931), The Defense of the Sampo (1896), tempera on canvas, 125 × 122 cm, Turun taidemuseo, Turku, Finland. Wikimedia Commons. With the Sampo stowed in their boat, Väinämöinen, Ilmarinen, and their crew from Kalevala set off to return home. The Mistress of Pohjola wakes up and realises what has happened. She sends the boat thick fog, a great wind, and more, to try to stop the removal of the Sampo. In The Defence of the Sampo (1896), Gallen-Kallela shows a scene from Songs 42-43, with the forces of Pohjola led by the Mistress at the upper right. Väinämöinen, still holding the tiller in his left hand, is shown with his long white beard and hair, brandishing a sword at her, and the crew fend her off with spears and boathooks. At the bottom left, Väinämöinen’s kantele made from the jaw of a huge pike has been lost overboard. This painting was commissioned by a rich decorative painter and trader, but after his wife had an “enormous nervous fit” when she saw it, the commission was amicably cancelled. When it went on public display it received high praise, and was considered the best painting that the artist had produced to date. 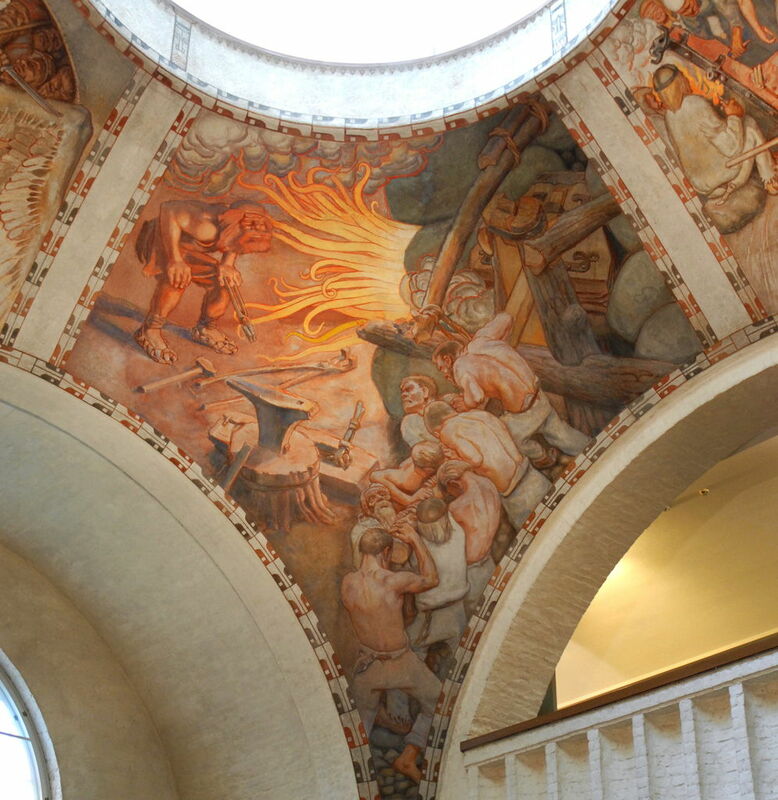 The most extensive paintings that Gallen-Kallela made of the Kalevala were his frescoes, originally for the Finnish Pavilion at the Exposition Universelle in Paris in 1900, but painted again in 1928 in the lobby of the National Museum of Finland, in Helsinki. They are extraordinary works and well worth seeing if you ever get to Helsinki. 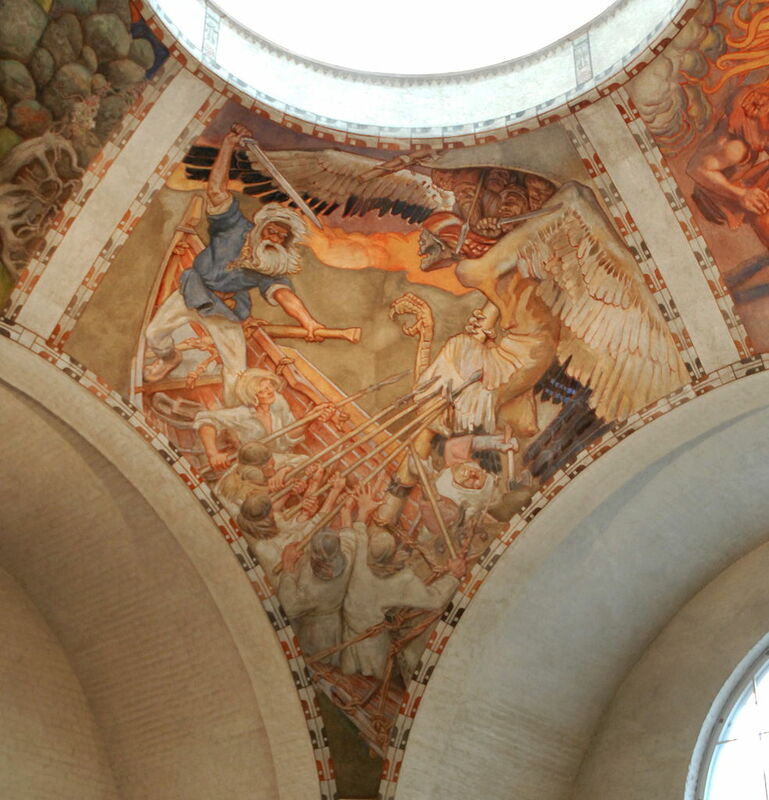 Akseli Gallen-Kallela (1865–1931), The Forging of Sampo (part of Kalevala Fresco) (1928), fresco, lobby of the National Museum of Finland, Helsinki. Photo by Jean-Pierre Dalbéra, via Wikimedia Commons. 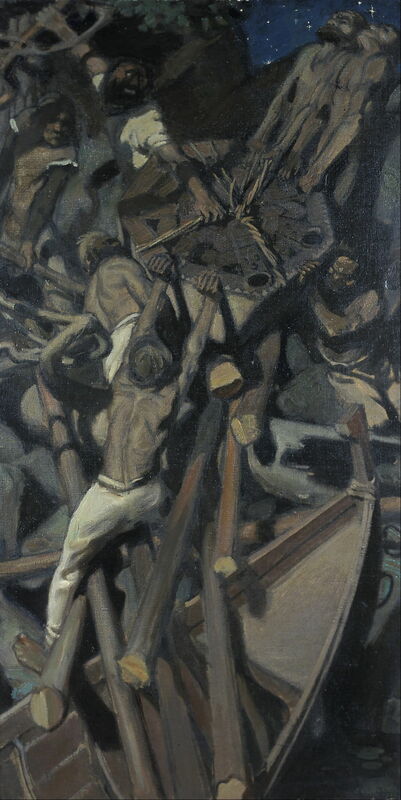 The Forging of Sampo (1928) shows a different account of the events in Song 10 (see above). 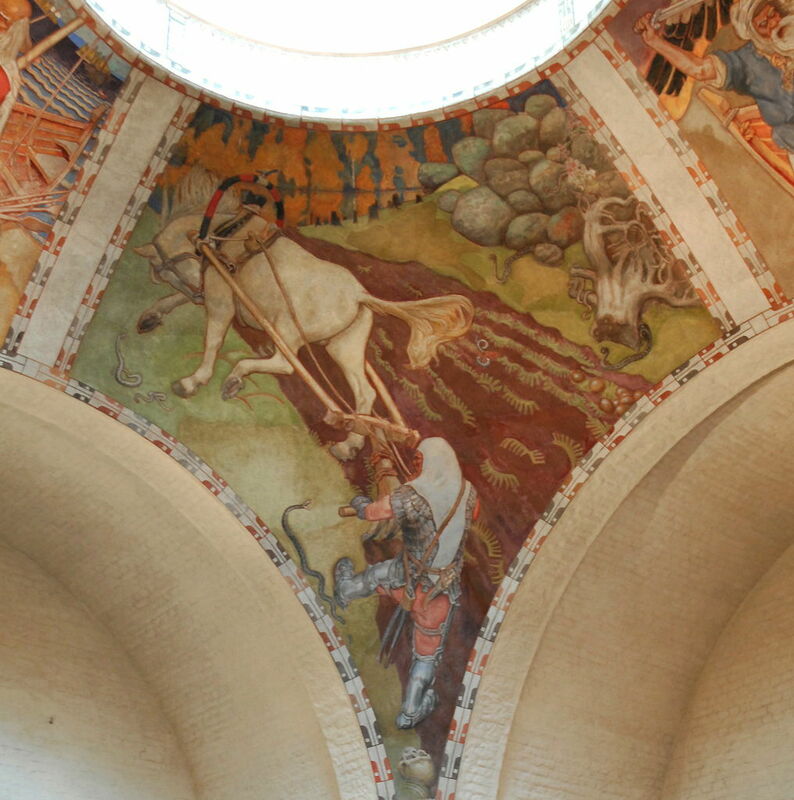 Akseli Gallen-Kallela (1865–1931), Ilmarinen Ploughs the Snake Field (part of Kalevala Fresco) (1928), fresco, lobby of the National Museum of Finland, Helsinki. Photo by Jean-Pierre Dalbéra, via Wikimedia Commons. Ilmarinen Ploughs the Snake Field (1928) shows Song 19, the first of three tasks required of Ilmarinen before he can have the hand of the Maiden of Pohjola in marriage. He has to plough a field which is full of snakes (vipers), which are shown attacking the horse and Ilmarinen, who is suitably protected by armour. 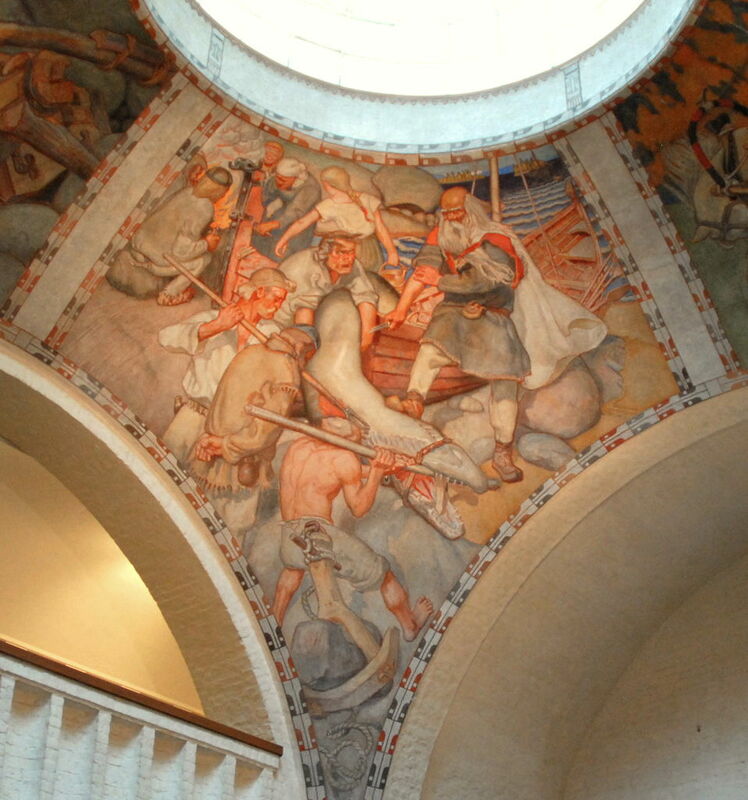 Akseli Gallen-Kallela (1865–1931), The Great Pike (part of Kalevala Fresco) (1928), fresco, lobby of the National Museum of Finland, Helsinki. Photo by Jean-Pierre Dalbéra, via Wikimedia Commons. The Great Pike (1928) shows a story from the journey of Väinämöinen and Ilmarinen to Pohjola to get the Sampo, from Songs 40-41. They catch a huge pike, kill, cook, and eat it. Väinämöinen later makes a kantele (Finnish harp) from its jaws, which he plays so beautifully that all creatures make their way to listen to him playing. 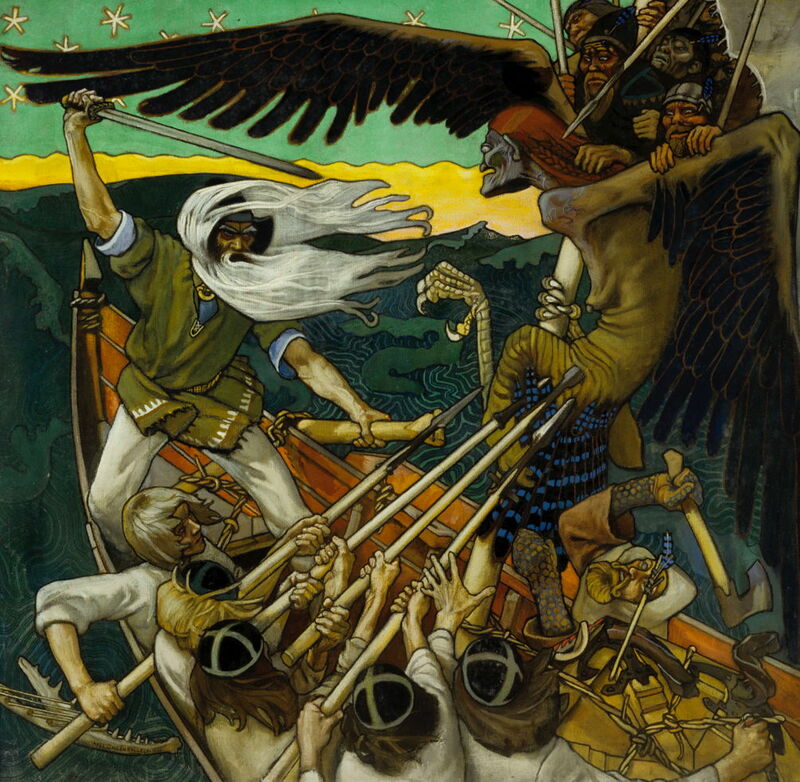 The Defence of Sampo (1928) shows the same scene from Songs 42-43 which the artist had previously depicted in his The Defence of the Sampo (1896) above. The compilation of the Kalevala opened up a unique opportunity for artists to depict the newly published but very ancient stories of Finnish culture. Those who responded did not disappoint, either in the quantity or quality of their narrative works. Neither did they see any need to embellish, embroider or otherwise tamper with the original narrative. It is a pity that other, older nations have not had similar opportunities which might have led to a richer range of myths being painted and so brought back into other cultures. As a result, Finnish painters do not appear to have undergone the same difficulties that narrative painting underwent in the rest of Europe during the late nineteenth and early twentieth centuries. This suggests that one of the major factors in those difficulties was the source of narrative subjects for painting: in the rest of Europe, classical stories had become hackneyed and were no longer seen as being integral to contemporary culture, but there did not appear to be other stories to replace them. Wikipedia on the Kalevala, and on Gallen-Kallela. The world’s best collection of paintings of the Kalevala is in the Ateneum in Helsinki, which also contains many other fine works by Finnish artists. It is a day well spent in a lovely city, although you will probably prefer to visit in the summer, as Helsinki can get quite bitter in winter. The National Museum of Finland, with its frescoes by Gallen-Kallela, is within walking distance of the Ateneum and well worth visiting too. Posted in General, Language, Painting and tagged Finland, Gallen-Kallela, Kalevala, narrative, painting. Bookmark the permalink.